Ghee - a small quantity. Add all the ingredients together and mix well to a smooth dough. Dough should be like poori flour. It should not be watery. Allow the dough for 15- 20 minutes.Divide them into 2 or 3 balls. Pat the ball in the flour and roll it to thin layer using roller pin. Cut it into circle or diamond shape. Repeat 4 & 5 steps to the remaining balls. 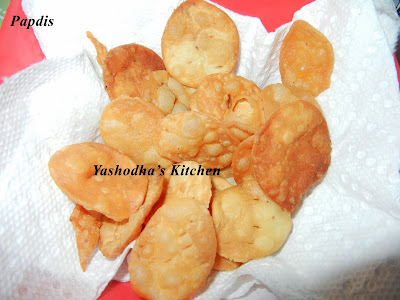 Deep fry all shaped dough and keep them on the paper towel. Papdis are ready. we can use it as it is or for bhel poori or some other chaat too. If you want circle shape, cut it using circle shape lid or cookie cutter like that. If you want diamond shape, use knife to cut.